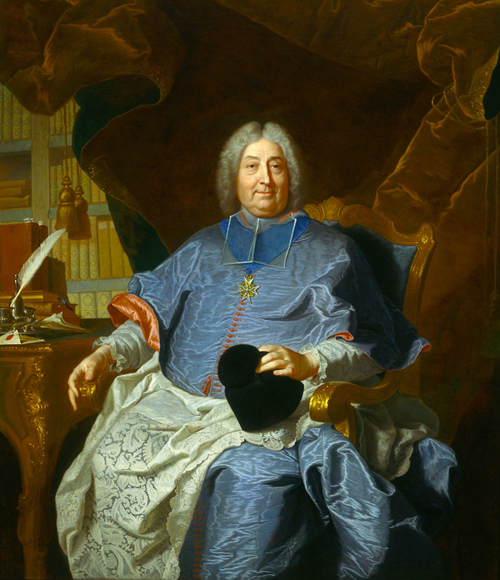 Next to the King, the archbishop of Paris was one of the most powerful men in France, and he surrounded himself with only the finest quality. Rigaud was the leading French portraitist of the early eighteenth century, often painting kings and royal families. His account book reveals that Archbishop Vintimille du Luc paid 3,000 livres (the French currency of the time) for this masterful likeness. The painting documents the archbishop's character and stature. The mild expression admirably suggests the conciliatory nature that made Vintimille du Luc famous for his diplomatic skills. Writing materials close at hand and a vest library in the background allude to his scholarly attainments and his work. His sumptuous attire, the exquisite workmanship of his desk and chair, and the theatrical backdrop of cloth are calculated to impress the viewer with the archbishop's power and wealth.